I have become completely obsessed with DIY sensory bottles. This one is both super easy to make and fun to play with. Sensory bottles are powerful tools for calming an overwhelmed or anxious child (or adult). They are also wonderful for no mess safe sensory play. Babies and toddlers can investigate all sorts of items without the risk of putting them in their mouths or choking on them. This DIY glow in the dark ringer game sensory bottle is made with glow in the dark rainbow loom bands and a golf tee. Playing with it can help young children learn to focus, calm down, and self-regulate. For more information about sensory bottles and their uses check out Calm Down Sensory Bottles 101. These glow in the dark loom bands don’t glow brightly or last long without an external source of light. They can be ‘charged’ by placing them under a regular light or in the sun, but the glow won’t last a long time. To make these loom bands really glow, a blacklight works best. Goo Gone or Olive oil. This bottle is easy to make. For the full tutorial see DIY Rainbow Loom Band Ringer Game Sensory Bottle. Use these glow in the dark rainbow loom bands instead of regular rainbow loom bands and follow the directions carefully. We had our first ringer game sensory bottle fail because the golf tee came unglued. Not so good. 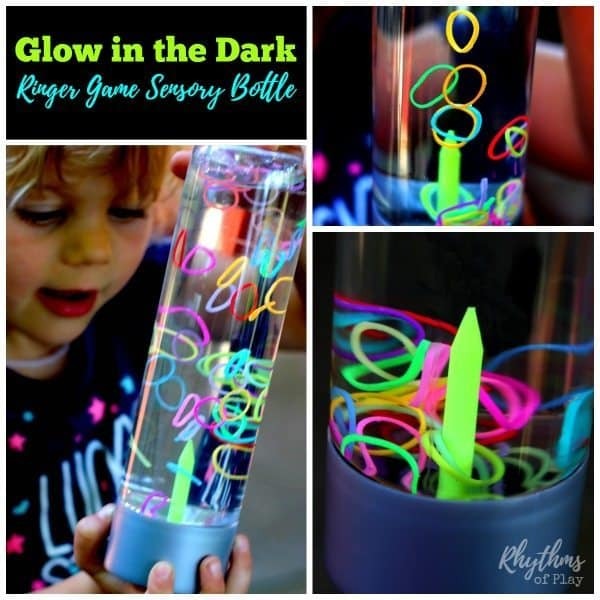 This DIY glow in the dark ringer game and our DIY rainbow loom band ringer game sensory bottle have both held strong since our second attempt. You won’t want to miss my tips! Play with your loom band ringer game sensory bottle for a few days before you glue the lid on. It’s super fun to play even though loom bands can be wacky. Sometimes they float! Don’t glue the lid shut right away so you can take the glow in the dark rainbow loom bands that end up floating out of the bottle after a day or so if you like. 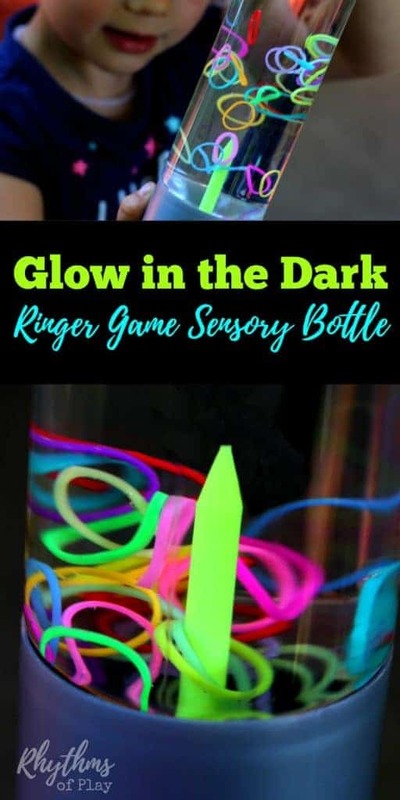 This easy to make DIY glow in the dark ringer game sensory bottle is a fun way to help children (and adults) calm down and unwind while they play. Discovery bottles like this ringer game for kids and adults can help children learn to focus and develop self-regulation skills. Sensory bottles can also be used for safe no mess sensory play. Babies, toddlers, and preschoolers can play this game without the risk of choking on the glow in the dark rainbow loom bands.